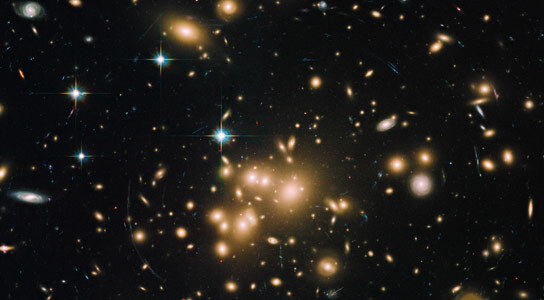 Using the Hubble Space Telescope, astronomers have uncovered the largest known group of star clusters and have confirmed that such compact groupings can be used as reliable tracers for dark matter. A team of astronomers, led by John Blakeslee of the NRC Herzberg Astrophysics Program at the Dominion Astrophysical Observatory in Victoria, B.C., used Hubble’s sensitivity and sharpness to discover a bounty of these stellar fossils, which is roughly twice as large as any other population found in previous globular cluster surveys. The Hubble observations also win the distance record for the farthest such systems ever studied, at 2.25 billion light-years away. Alamo-Martinez is also the lead author on the team’s science paper describing the results. The paper appears in the September 20 issue of The Astrophysical Journal. 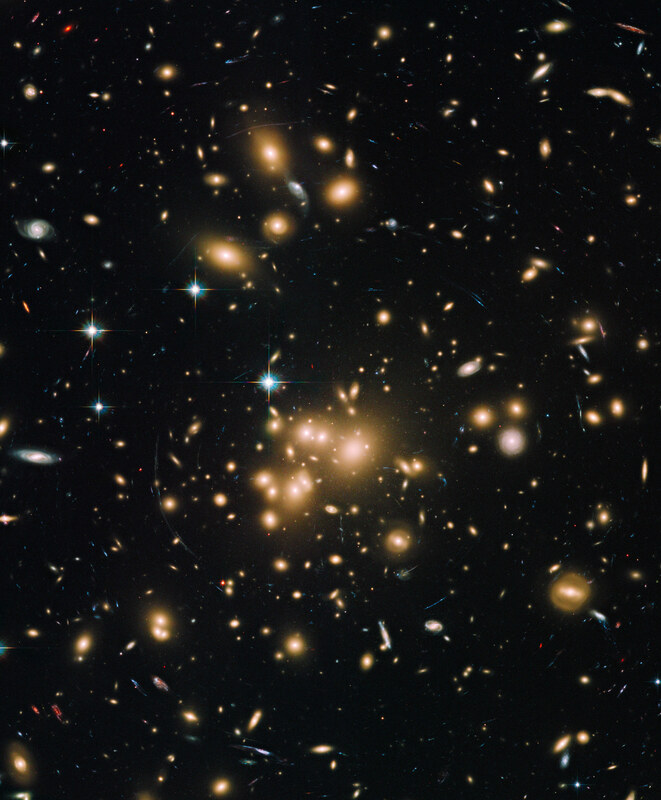 The image at left, taken by Hubble’s Advanced Camera for Surveys, shows the numerous galaxies that make up Abell 1689. The box near the center outlines one of the regions sampled by Hubble, containing a rich collection of globular clusters. The monochromatic view at right, taken at visible wavelengths, zooms into the region packed with globular clusters. They appear as thousands of tiny white dots, which look like a blizzard of snowflakes. The larger white blobs are entire galaxies of stars. Although dark matter is invisible, it is considered the underlying gravitational scaffolding upon which stars and galaxies are built. Understanding dark matter can yield clues on how large structures such as galaxies and galaxy clusters were assembled billions of years ago. The Hubble study shows that most of the globular clusters in Abell 1689 formed near the center of the galaxy cluster, which contains a deep well of dark matter. Their number decreases the farther away Hubble looked from the core, corresponding with a comparable drop in the amount of dark matter. 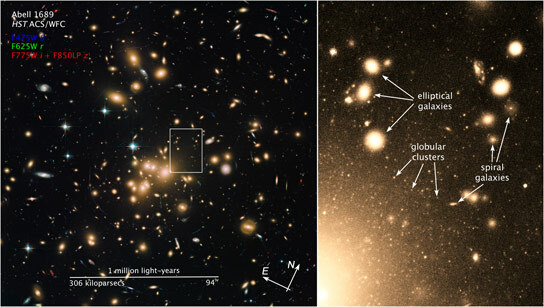 The astronomers used Hubble’s Advanced Camera for Surveys to peer deep inside the heart of Abell 1689, detecting the visible-light glow of 10,000 globular clusters, some as dim as 29th magnitude. Based on that number, Blakeslee’s team estimated that more than 160,000 globular clusters are huddled within a diameter of 2.4 million light-years. “Even though we are looking deep into the cluster, we’re only seeing the brightest globular clusters, and only near the center of Abell 1689 where Hubble was pointed,” he said. The brightness of most of the globular clusters is estimated to be 31st magnitude. This is out of reach for Hubble, but not for NASA’s James Webb Space Telescope, an infrared observatory scheduled to launch later this decade. By going fainter, Webb should be able to see many more of the globular clusters. Blakeslee’s quest to use Hubble to conduct a globular cluster census in Abell 1689 began 10 years ago after astronauts added the Advanced Camera for Surveys to Hubble’s arsenal of science instruments. While analyzing some gravitational lensing data of Abell 1689 obtained with the newly installed camera, Blakeslee spotted dots of light peppered throughout the images. The dots turned out to be the brightest members of a teeming population of globular clusters. Be the first to comment on "Hubble Reveals Largest Known Group of Star Clusters, Clues to Dark Matter"